With NORML’s new PledgeMe campaign, Suits for Stoners, you can donate a suit to a poorly attired cannabis activist and see them magically transformed from ignored and belittled nutbar to serious, esteemed lobbyist. That’s all it takes! 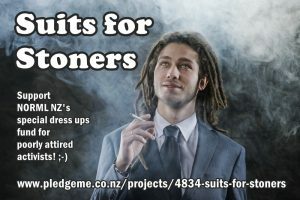 Go to Suits for Stoners on PlegeMe.co.nz now! Cannabis law reform is sooo hot right now. But some people say cannabis activists are all loser stoners who should “get a suit“. With so many people using medicinal cannabis, and so many more supporting safe legal access, we think it’s no wonder there is a wide variety of different folk calling for law reform. The real problem is that decision makers discriminate against some people based on the way they look. It is an easy excuse to dismiss or invalidate our concerns and experiences. Clearly most people do not think this way. Recent NZ cannabis opinion polls show significant majorities supporting law reform for both medicinal and adult use. Four out of five supporters of medicinal cannabis law reform also support wider reforms for adult use. No reasonable person would expect people who campaign for LGBQTI rights to “act straighter”, and it would be nuts to insist women “act like men” to get pay equality, yet cannabis reformers are expected to be something they are not before decision makers (and some user groups) will listen to them. But appearances seem to make a difference to some people, so let’s just run with it and get us some Suits for Stoners! Defenders of the current law often cite the allegedly scruffy image of “loser stoners” for “getting in the way”. Suits for Stoners will let these conservative types see past the stereotypes and finally listen to our messages (ie, facts, evidence and reason). All funds received will go to NORML New Zealand Inc, into a special dress ups fund for poorly attired activists. We have options from $20 op-shop hand-me-downs to $2000 Armani tuxes – because when it comes to advocating for sensible cannabis law reform, how we look is more important than what we say! $10 gets us the ultimate bling for entry into the smokey back rooms of where deals are made. A top hat, cigar and monacle will get you anywhere! These will just be plastic toy versions but could be handy for playing Monopoly. $20 gets a pre-loved suit from the Sallies, to be given to a cannabis activist in New Zealand. They’ll go from looking like a tramp, to not quite looking like a tramp. Or a stockbroker from the 80’s. This may help us get an appointment with some Very Important People, and they might actually listen to us! This one’s for the ladies… $50 puts one of our sisters of sensi into a pre-loved power suit, all the way from some op-shop. $150 will get NORML a full colour life size cardboard cut out of a respectable suit that we can take turns standing behind. For $499 this suit will be good for a year or two of high end lobbying, before the elbows go shiney! Donate a fancy new suit (or women’s executive outfit) to a cannabis activist in New Zealand. Help them hide the toll of years of prejudice and discrimination, let them ease the weary lines on their tired faces. Now they will finally be listened to. But probably still not trusted! $2000 and they will believe anything we say! No citations or evidence will be needed. Armani rules over all, with fine fabrics and tailoring that will have Very Important People accepting us as equals, their ears bending to believe every sweet weedy whisper. This reward will go to a needy, scruffy, cannabis activists in NZ (guy or gal). Remember, when it comes to cannabis activism, it’s “get a suit” or “be quiet”! Note: In all seriousness, this is a piss-take if you hadn’t realised! This started as a joke but we will actually do it though. Your funds really will go to putting stoners in suits!